During our recent trip to Atlanta we went to the Oakland Cemetery ( http://www.oaklandcemetery.com/) near downtown Atlanta. If any place ever summed up the futility of wars this is the place. You will find confederate soldiers, union soldiers and slaves buried here along with Margaret Mitchell and former Atlanta mayors and other notables. The people buried here lived on many levels but ended up inside the same stone fence. The image above is of my favorite of the many statues and monuments contained within the cemetery. 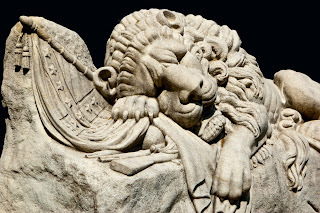 It shows the dying Confederacy characterized by the lion which originally had a wooden lance in it's back. The cemetery is located fairly close the the Martin Luther King National Historic Site.